The Spur Ex-Student Association Board is so thankful for your donations. We could never have offered seven $1000 scholarships without your support! The 'drag', full of people and cars honking on a fall afternoon tells you it's time for the annual Homecoming celebration! If you've ever lived in Spur and attended Spur ISD, you know about our wonderful Homecoming events. It is the most exciting weekend of fun, visiting, and football for Bulldog fans. Ex-students from all decades return to Spur to see old friends and take in the traditions. It's only when you move away and begin your adult life that you realize what a great celebration we grew up experiencing. I assumed all schools celebrated like SHS--that's all I knew. Being a cheerleader and always a big part of the activities is a wonderful memory. When my husband and I married, he couldn't understand why I needed three days to attend our Homecoming activities! When he joined me in Spur, he had a great time taking in all the fun. Through the years, I've realized almost all other schools' homecoming activities consisted of a football game with a mum and four queen candidates. Their class reunions are nothing like ours at Spur! As I grew older, I cherished even more the memories of those fun weekends in Spur where everyone felt welcome at all of the events and class parties. Thank you to the hometown folks who had the vision to create such a wonderful tradition for us to enjoy and duplicate. 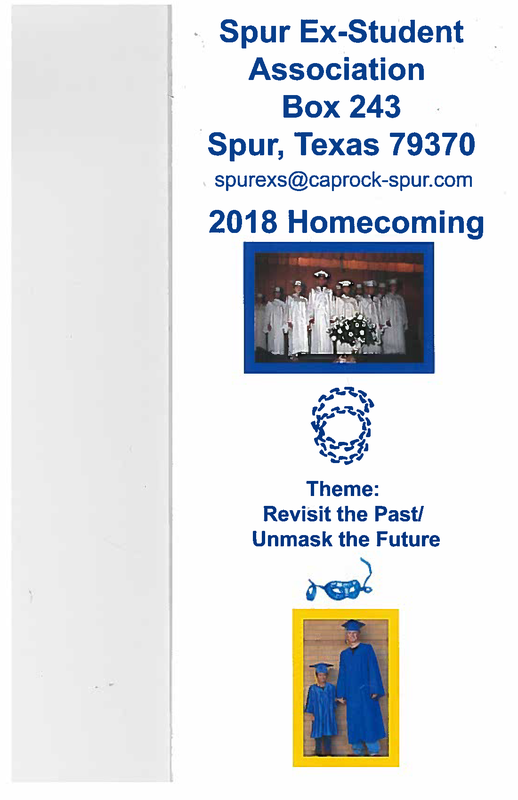 Thanks to those who have raised their families in Spur, or came back in their later years and became a part of the effort to keep our Homecoming traditions going strong. The people who are 'from Spur' have a sense of pride you don't see in other towns. It is with great pride when I tell someone I'm from Spur because there's always a story to be heard about someone or something from Spur. Enjoy Homecoming if you can attend and stop by and visit and pay your dues -- only $10. Your donations keep the organization active. If you can't attend, please pay you dues and/or send a donation anyway so we can continue to celebrate our hometown each year.